Redland City Council is giving the next wave of innovative Redlands Coast entrepreneurs a flying start through a series of start-up and innovation initiatives. 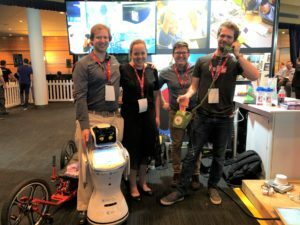 Redland City Mayor Karen Williams said Council’s commitment to supporting local innovators included a group of Redlands Coast businesses that recently attended QODE – Australasia’s leading global forum for innovation and technology. “Council’s economic development team has been working closely with a number of local businesses to build their innovative ideas that will ultimately help them grow their businesses and benefit the broader Redlands Coast community,” Cr Williams said. “This included supporting three amazing Redlands Coast start-up businesses, RCG, Freelance Robotics and Switch Node, to attend last week’s QODE, helping them to connect with investors and innovators. Cr Williams said the success of these Council-led initiatives could be seen in the work of local start-ups such as PowerWells, which won the Duke of York’s Pitch@Palace national leg of the international entrepreneurial competition for its creation of cheap portable power supplies for remote communities. “PowerWells, which was born from an idea at a Council-led brainstorming session, has underscored the value of Council’s economic development program, which includes pitch events for local entrepreneurs,” she said. “PowerWells has since gone from strength to strength. “They pitched their idea and developed it in a weekend and now have their PowerWells lighting up Indonesian communities. “In collaboration with Council, StartUp Redlands now opens its doors every month to start-ups to allow them the opportunity to pitch their service or products to a room of entrepreneurial enthusiasts, as well as open doors to local angel investors to help them make their ideas a reality. Cr Williams said Council now hosted regular collaborative events for local start-ups and was working to bring great thinkers and innovators to Redlands Coast for the Young Entrepreneur Summit on 13 September this year. “Council secured funding through the State Government’s Advancing Regional Innovation Program to lead the delivery of innovation and entrepreneurship activities in the Redlands Coast – Logan region and we were thrilled to be able to showcase at QODE what has been achieved,” Cr Williams said. The Advancing Regional Innovation Program is a partnership with Logan City Council, Griffith University, Alexandra Hills TAFE, Redland City Chamber of Commerce and other key partners with an interest in building the innovation ecosystem for the Redlands Coast – Logan region. Redlands Coast start-up business owners Nathan Smith and Rusty Routledge, from Switchnode, Rebecca Grugan, from RCG, and William Pagnon, from Freelance Robotics.